There is something about good things stuffed into other good things that comforts me. 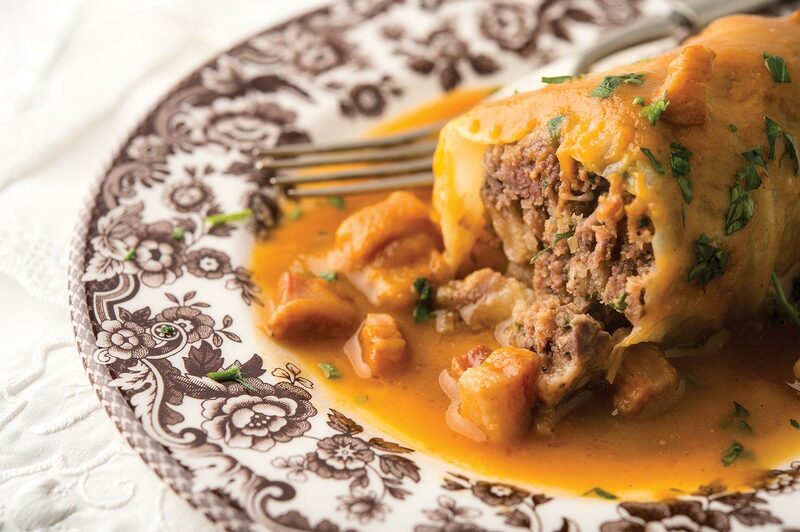 Stuffed cabbage is high on that list. Nearly all my favorite comfort foods, foods I crave when I am tired, emotionally, mentally or physically, involve some sort of culinary parcel of love. Ravioli, tamales, pierogis, pasties. And, yes, these stuffed cabbages. 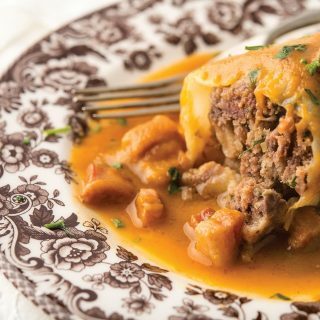 Stuffed cabbage is normally thought of as an Eastern European/Slavic thing, and it is that. But the French also stuff cabbages, as I am sure so too do the Germans, Italians and probably everyone else who eats cabbages. It just seems like the thing to do with those big outer leaves. This is a French recipe, very loosely based on one from Paula Wolfert’s fantastic book The Cooking of Southwest France. The cabbages are stuffed with ground duck, bread, herbs and good things, wrapped in the cabbage leaves, then simmered in a quirky tomato sauce. The tomato sauce is rather odd. It starts normally, with some fat, onions, carrots and garlic, white wine and obviously tomatoes. But it has a peeled apple pureed into it at the end, which seems wrong but actually adds a light sweetness to the zippy tomatoes. Whoever came up with the idea was on to something. Of course if you don’t happen to have ground duck lying around, you can make these stuffed cabbages with any ground meat. 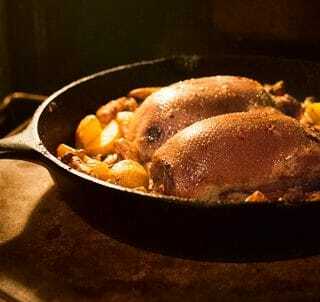 They are full of flavor, tender, and, most importantly, comforting in cold winter or tough times. Once made, stuffed cabbage keeps in the fridge for a few days quite well. 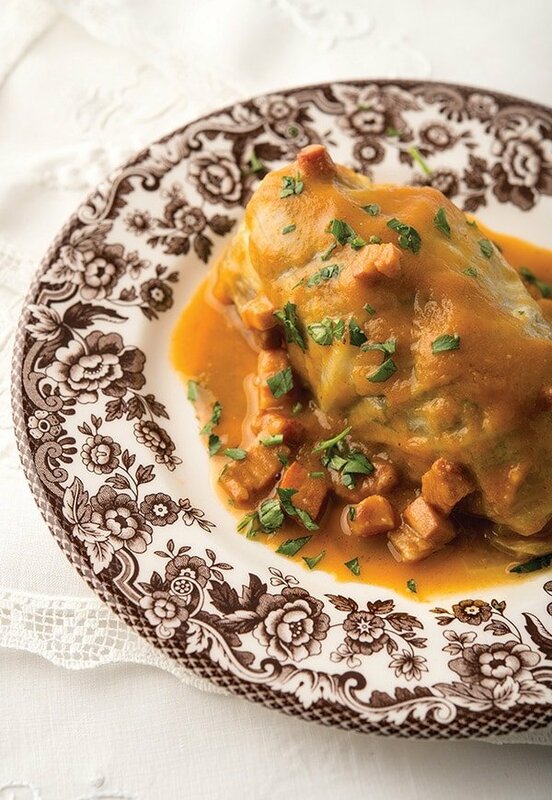 Clearly you don't need duck to make this recipe, as stuffed cabbage is good with any meat. Other than that, this is a pretty easy recipe to make, with standard ingredients. I really like the little meat dice in this, as they ad a nice textural touch. Salt pork, bacon, pancetta, prosciutto or some other cured ham -- all will work. Just remember that of them all, salt pork is the saltiest, so watch the salt levels in the rest of the dish. Prep the Cabbage. Bring a large pot of salty water to a boil. Boil the cabbages -- probably one at a time -- for 5 minutes. Run them under cool water until you can handle them, then gently remove as many large leaves as you can; these are what you will use as wrappers. Set the leaves on a towel while you make the sauce and filling. Start the Sauce. Cook the bacon dice until they are crispy, then set aside. Add the chopped onion and carrot to the pan and cook on medium heat until the onion turns clear, about 6 minutes. Add the garlic and cook another 90 seconds. Add the white wine, tomatoes, chopped apple and 2 tablespoons of parsley, along with the thyme and salt to taste. Simmer gently while you make the filling and stuff the cabbages. Make the filling. While the sauce is simmering, soak the dried bread in the milk for 15 minutes, then squeeze out the bread to remove excess milk. Mix everything else together, along with 2 more tablespoons of parsley, until it holds together like meatloaf. Stuff the cabbages. Lay out a cabbage leaf with the stalk facing you and place some filling inside; amounts will differ, as the leaves are different sizes. Fold the stalk end over the filling and then fold in the sides, then give the leaf one more roll to secure; this is like folding a burrito or a package. Repeat until you have used all the filling. Simmer the stuffed cabbage. Pour the sauce into a blender and puree. Add salt and black pepper to taste. Arrange the stuffed cabbages seam side down into a wide, shallow pan with a lid, then pour over the sauce. Jiggle the pan to coat everything. Sprinkle the reserved bacon over it all, cover and simmer for 45 minutes to 1 hour. Serve with the remaining parsley sprinkled over the top. Note that you will not be using all the cabbage you need for this recipe. Plan on using the center cores of the cabbage for slaw or some other dish. You can find more than 100 recipes for all varieties of ducks and geese, here on Hunter Angler Gardener Cook! Mine is simmering as I write made from a deboned year old drake Wigeon (I found this one way in the back of the freezer…damn) and the legs and wings of four Cackling Canada Geese from a few weeks ago!! The sauce is spot on the same color as your photo. I used standard thick cut, Hickory-smoked bacon, but I bet pancetta would be better. Thanks for the recipe!! Hank this looks awesome! I am not a duck hunter and I don’t have any ground venison. Think regular beef would be alright? Thanks! Steve: Of course. Any ground meat works. I forgot to mention the legs and wings of the geese were also deboned (otherwise grinding would have been difficult and splintery). It turned out great!! The bacon worked out just fine although I think I would prefer pancetta in the sauce. Will definitely make this again. Made this with ground venison.. very, very delicious!